I have two Ram sticks but CPU-Z says that i'm running single channel? I don't understand RAM much at all, but i noticed that when i went into task manager, that the 100% consumption rate of my RAM would be 4gb. This led me onto searching about it, to discover something about single and dual channel RAM setups. I have two RAM sticks, and only two slots on my motherboard, but on CPU-Z apparently it's running as single channel? I'm confused to say the least. How do i make it a dual channel setup to increase maximum rates to 8gb? Setting ram to run as dual-channel is normally done in the BIOS. You will have to search around in the BIOS because they use different terms. Check your motherboard's manual for a description of the BIOS functions. 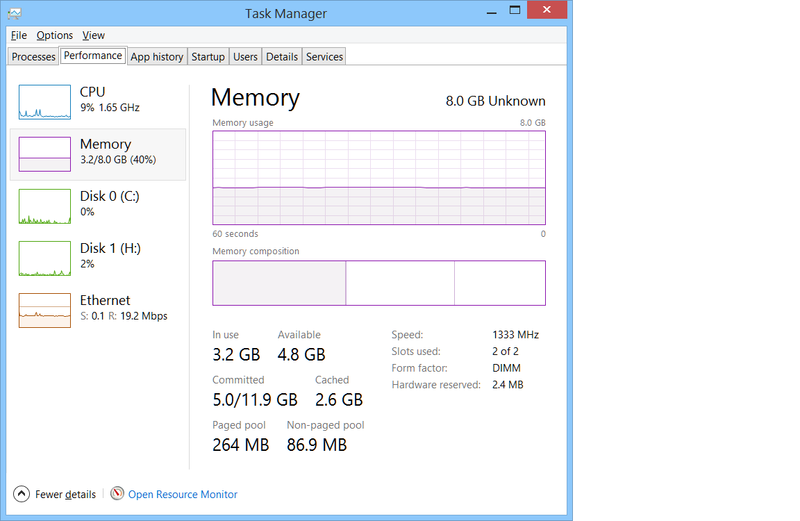 Does Task Manager see all 8GB? Are you running a 64 bit version of Windows? 32bit versions are limited to using 4GB (actually a little bit less). I have 64 bit windows. I have been in the BIOS but there is no option to change to dual-channel mode, unless it's worded weirdly or something? Some motherboards may automatically switch to dual-channel mode when 2 sticks are detected. Go to the Performance Tab in Task Manager and click on Memory. In my example below, the system sees 8.0GB of RAM, which is what I have installed. Make sure both RAM sticks are firmly inserted into the DIMM slots on the motherboard. You may want to remove the RAM and re-seat it. Do this with the computer turned OFF. It appears that your system is only seeing one stick of RAM. Could be a loose connection, bad RAM stick or bad DIMM slot. In CPU-Z on the SPD tab, can you click on the Memory Slot Selection to toggle between Slot 1 and Slot 2? The place to ask a question is in a new thread, with a detailed description of the history of your problem and your full specs, not in someone's old thread describing their problem from 2017. [SOLVED] Can i use 2 simular sticks of ram to run in dual channel? Question 4 sticks. runs fine for hours. then bsods. Is it possible to run 2 ram sticks(that cant run in dual channel) in single channel. Do motherboards with dual-channel need two sticks of ram to run? Why do my ram sticks run on single channel mode on Asrock 990FX EXTREME9?